When you think of Captain America, The Hulk, and X-Men, you no doubt think of the father of Marvel, Stan Lee. But these characters, Marvel comics, and even comics as we know them today wouldn’t exist without Lee’s collaborator and illustrator Jack Kirby, who would’ve celebrated his 100th birthday today. To give you an idea of this illustrator’s badassery, he got his start in the comics scene with Captain America #1, featuring Cap punching Hitler in the face. And he was kind of a real Captain America, once leaving his office to fight Nazis in the street (seriously). While Lee has Marvel movie cameos, Kirby deserves a nod in every film too; without him, these stories may not exist. Common comic elements like double-page action spreads and the ‘shared universe’ all came from Kirby. And because Lee was serving as Marvel’s only writer and editor-in-chief in the ’60s, often the artists would have to create the story without a script, meaning that artists like Kirby constructed much of the narratives. While his Marvel work may be the most widespread part of his legacy, his art was also partly responsible for the success of the CIA mission, ARGO (yes, like the movie). This goal of this secret mission was to recover hostages from the American embassy in Iran. As a cover, they pretended they were there to film a movie; ARGO. 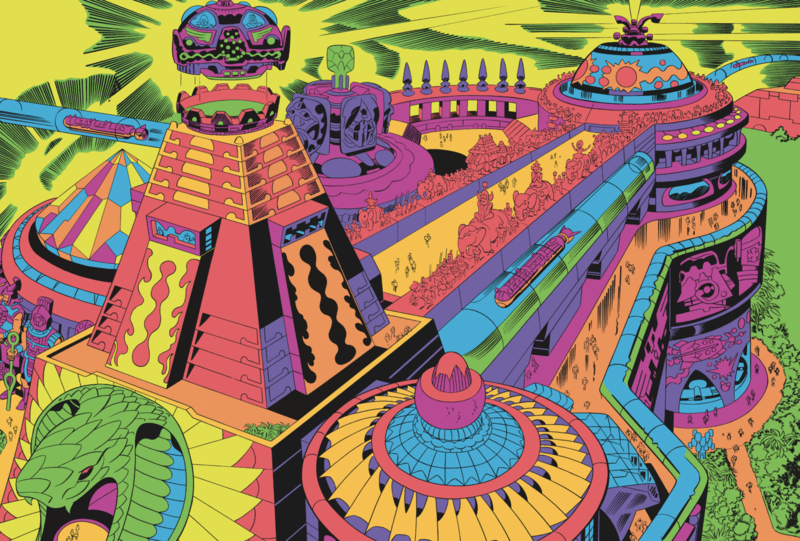 But in fact, the concept art and script they used were taken from a real-life film project that Jack Kirby was working on called Lord of Light – an adaptation by filmmaker Barry Geller of the book by the same title. 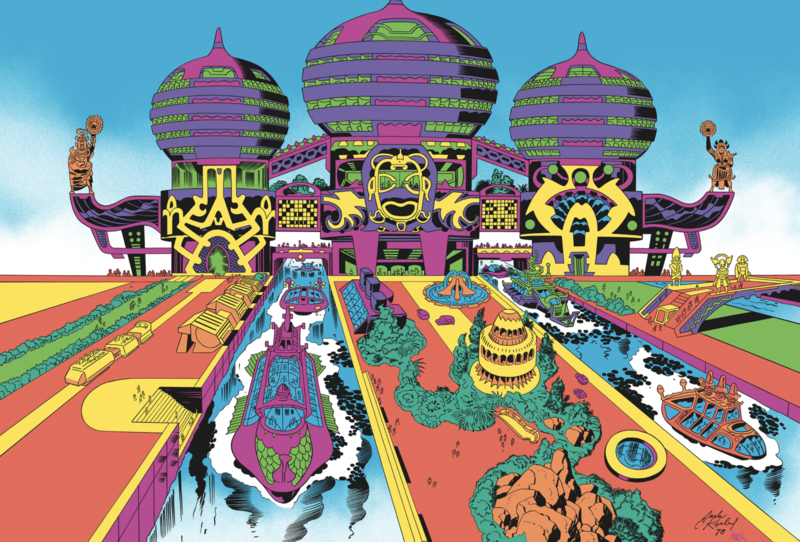 The actual Lord of Light film would’ve been an epic undertaking, along with a massive theme park called Science Fiction Land that would have used the sets from the film of Kirby’s design as the film’s companion. The art for this project has now found new life, with colorist Mark Englert giving them full color in 2015 and getting featured in Heavy Metal Magazine #276. 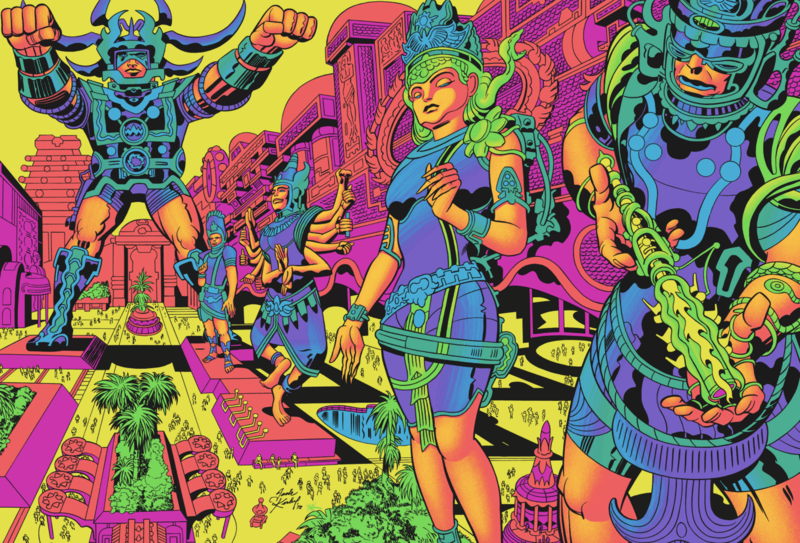 In honor of Jack Kirby’s 100th birthday we talked to his collaborator and the writer of Lord of Light movie Barry Ira Geller about what it was like working with Kirby, his legacy, and what it’s like seeing his and Kirby’s Lord of Light concepts brought to life! You and Jack Kirby are such visionaries: what was the concept brainstorming process like with him? He was a very powerful creative force. We would look at how certain destinies were being created through the use of the drawings. We had some vast goals and we were both intent upon changing the imaginations of children, which was always my goal ever since I was doing Science Fiction Land…we saw everything that we were doing as an upcoming reality. The original plan was to use the sets of the film to make a theme park…so I was looking for an artist to do exactly that. And I interviewed a bunch of artists and I would say, “do something like Jack Kirby!’ and never was happy. And when I found out Jack lived in California, the rest is history. Most importantly, I was connecting up with some of the big scientists at the time and technologies, and essentially I wanted all the latest stuff I could get my hands on, and just to then present it to the public on an entertainment basis. So we felt we were changing the world, and the concept art was the beginning stage of that. What was he like as a creator? There was a certain gleam in his eyes – strange as it may sound – that made it seem like he was there, he was always there. He didn’t drive because he told me he’d just drive into the rose bushes because he’s thinking. But he really lived in another place. Everyone just thought he was very imaginative. Well, the fact is he really did live there. And if he hadn’t been an illustrator and story writer, who knows; maybe he would’ve tried to take over the universe or something. But it was amazing to take it all in. And that was what I did right – I never tried to tell him what to do. Instead, we developed an idea together. 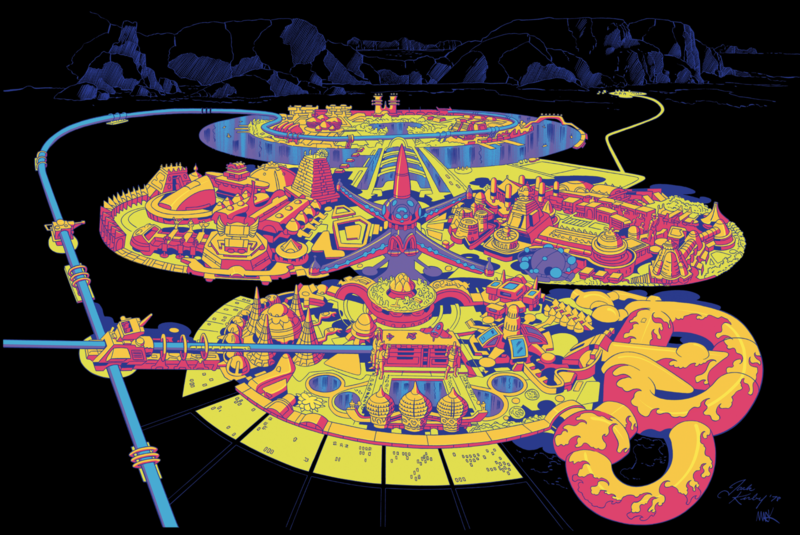 What do you think of Kirby’s Lord of Light art in full color? Well to quote my friend Tom Kraft, who’s the president of the Kirby museum: it’s just too good! He took two years to work on the original negatives – which are now available for sale – and he just was blown away. I would say that what Threadless is doing right now would just tickle Jack to the end! This is bringing our original designs out to children, to people…you’re sort of doing what I was trying to do, a little differently, but you’re still making it real, it’s in the real now, people wear this stuff. I think it’s gonna alter the future and I think you guys are opening up a whole new territory of what the meaning of merchandising is. The way this stuff was started, it wasn’t just a specific “give me some production designs”, which people thought was the case. But no, we spent a lot of time together developing it. And some of them are 70% me and some of them are 70% Jack. But it encapsulated the ideas of what everybody was about. …we felt we were changing the world, and the concept art was the beginning stage of that. 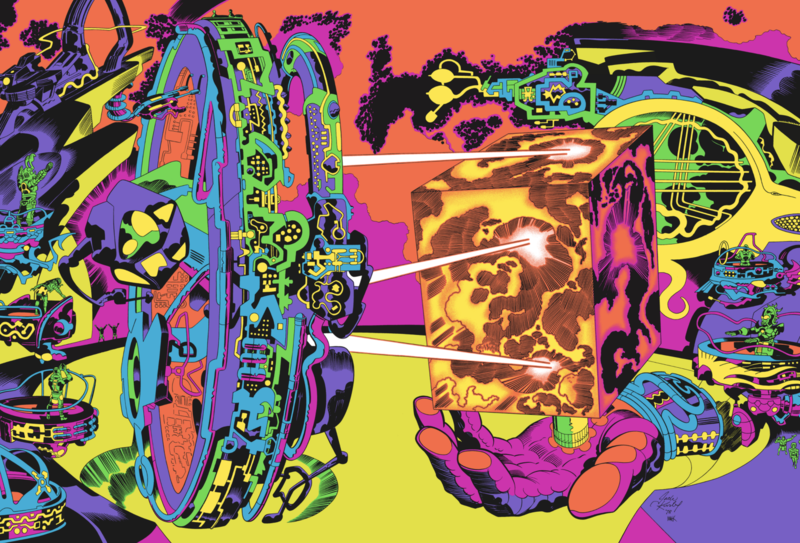 So which of the designs were more you and which were more Jack Kirby? The “Pavilions of Joy” was my idea, but it was really mostly Jack, for example. But it was in my screenplay, not in the book. What is in the book is one line but some point, Kali changes her mind and wants to save Sam’s life, so she appeals to Brahma to save him, and so Brahma says, and this is what’s in the book: “of course, my darling goddess. Why don’t we spend a weekend over at my pavilions of joys and we’ll discuss it?”…That was the story behind pavilions of joy. 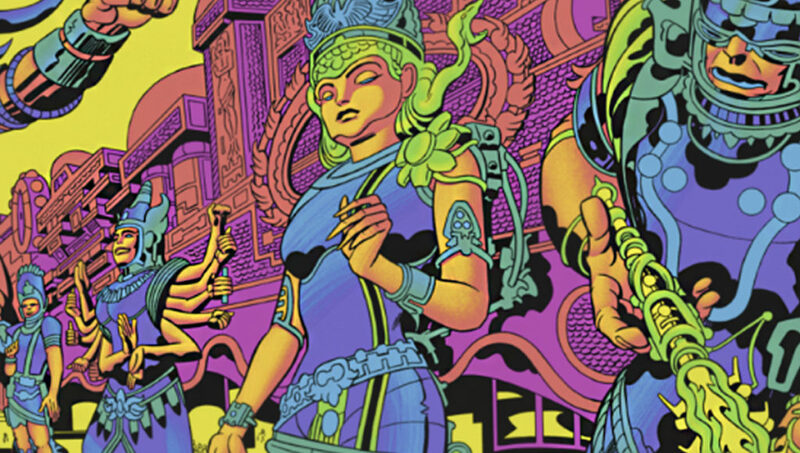 On his 100th birthday, what part of Jack Kirby’s legacy do you most want people to remember and think about? For years I’ve been trying to get people to recognize him for the creator he was. For the longest time, even a few years ago, people, young children, wouldn’t know who Jack Kirby was. So it was always my plan to get the word out, talk about it, which is why I, for a few years, would print out prints and sell them for nothing just because fans loved them. That’s it. And strangely, maybe about 15 years ago, someone bought a copy of one of them for her son’s birthday. And then about three years ago, I’m sitting in front of this guy who’s the number one drawer for Batman, who works with Grant Morrison…and the first artist was that kid who the mother bought that print for [Chris Burnham]. He showed me a picture – it was on his wall for 10 years, and it was just really great. I’ve found if I was to sum up all these events, I can just talk about the connectivity of life in so many ways…at some point, you can’t deny it, we do make a difference. Ray Bradbury, Alfred Bester, who wrote The Stars my Destination…it was John Chambers who, and I always would say “John-effing-Chambers”, who created a whole new vision – I think it was his work that was singularly responsible for the bridge into science fiction in film. I was working largely with the people who influenced me. When I was 16, I was buying comic books off of a news stand in the Bronx, and I saw this great spread for The Fantastic Four that was a photo montage as well as everything else that was going on, and that was the end. That was the end for me. I was a big science student, actually won prizes at science fairs, but after that my mind was gone, seeing that Jack Kirby panel. It just all came together. As far as your Lord of Light script and art, after what happened with the ARGO mission, your work really did end up doing what you set out to do with it: it changed the world. How do you feel about that? My first response in finding out that Argo was going to be a film was shocking…because I had wanted it to come out, I wanted to have more control over it. But try arguing with God and see how good you do. Making a deal with Heavy Metal, it got the work out there again. And I began to see that people would respond or react knowingly when I just would mention the word “ARGO”. So I began to look at things a lot differently, but the real moment came when I was giving a lecture at Comic Fest. And here I was talking about the finer points of Lord of Light…and what most people wanted to know was about ARGO and about what really happened. And that’s when it really dawned on me that the ARGO experience to me and Jack was a way for life to bring us back. And it’s so strange because the director could have easily put in the drawings. The real story could’ve easily been told…however, when I would go onto Wikipedia to try to sort some things out, by the time I was 15 minutes in, somebody had erased what I had already written. In a lot of ways, it’s all been corrected. Now people see what really happened, so that’s the good thing. After all is said and done, it’s something that people wanna know!